Once a very popular tourist spot, Venezuela is fast becoming an off the beaten track destination. Certainly there are problems--crime, an omni-present military, food shortages, poorly-maintained roads. 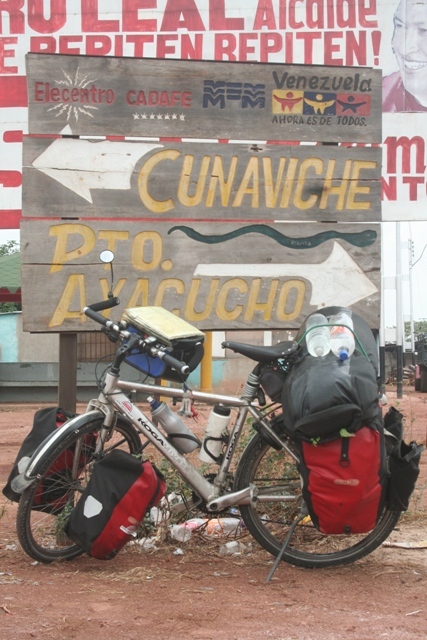 Although biking Venezuela can be frustrating, amazing landscapes, welcoming locals and the ride through the magnificent Gran Sabana make up for most of the inconveniences. Give Venezuela a try, you won't regret it. Venezuelans are some of the craziest drivers on earth, so beware. You're in for a big shock if you're crossing the border from orderly Colombia. With some of the cheapest gasoline on earth, the car is king in Venezuela. Everybody drives in the land of Hugo Chavez. Road conditions vary greatly in Venezuela, with many surfaces desperately in need of repair. Major highways are often in perfect condition, but interior roads are as bad as any in the developing world. In such a vast country, choosing a route is no easy task. You may want to hit the interior to get a taste of the Andes and the vast plains of Los Llanos, then you could swing on through the Amazonas Region before ending with a bang in the Gran Sabana. That's what we did, and it makes for interesting biking, in spite of some long slogs through sparsely populated regions. You'll get a real feel for Venezuela and all its diversity. Remember, you can always hop on a truck if the cycling gets to be too much. We used Reise Know-How's detailed Venezuela map. It's water and tear resistant, making it the perfect map for a bicycle tour. Hotels in Venezuela are fairly expensive, you probably won't be able to find a room for under $15. As usual, your best budget option is camping. Fortunately, Venezuelans are good-natured, hospitable people who love to meet foreigners, so finding a spot to pitch a tent isn't difficult. Farmers and villagers will likely never say no to your request. Sometimes you might end up with quite a nice place to camp, say with a swimming pool next door, lake view or comfortable outdoor kitchen and other facilities to use. Venezuelans were very considerate, often inviting us to stay an extra day, use the washing machine or even arranging for us to stay with friends and family further along the route. Churches are also a good option in Venezuela, but camping at school grounds is more difficult because of security-- every thing's locked up behind high barbed-wire fences and getting permission is difficult. Bike touring in Venezuela will be expensive (even at the better 'unofficial' exchange rate) if you eat at restaurants and stay in hotels. Restaurants are especially bad value, a basic meal could easily set you back $8. Food prices vary considerably. Many foodstuffs--spaghetti, powdered milk, dairy products, meat-- are subsidized by the government and therefore incredibly cheap. Fruits and vegetables are also very cheap in large cities, but in rural areas you might pay 5 times more. Anything imported is costly. Our daily average in Venezuela was actually quite low, about $6 per person, per day. That's not much, but we always camped, never ate in restaurants and bought basic food products. Even the slightest splurging will blow your budget in Venezuela. There are two exchange rates in Venezuela, the official one--which is artificially low--will give you around 4.3 Bolivares for $1. The unofficial (read black market) rate is around 6.5 Bolivares for $1. Obviously, you will not want to use your ATM card to withdraw money in Venezuela because you will receive Bolivares at the official 'rip-off' government rate. There is a thriving black market in Venezuela and you'll want to change cash--either euros or US dollars-- at the more favorable, un-official rate. If you're coming from Colombia, you can change Colombian pesos or USD at a good rate at the change bureau on the Colombian Macaio border before entering Venezuela. On the Venezuelan side, money changers may not offer you as good a rate. You may also be able to change in shops, especially in tourist areas. Insist on a decent rate, you'll get it. Dollars are in high demand in Venezuela. Venezuela is, unfortunately, one of the most dangerous countries in South America. Most violent crime is concentrated in large urban areas, but even some smaller towns can have serious problems with security. In general, the Andean region and the interior are safer than the coast. 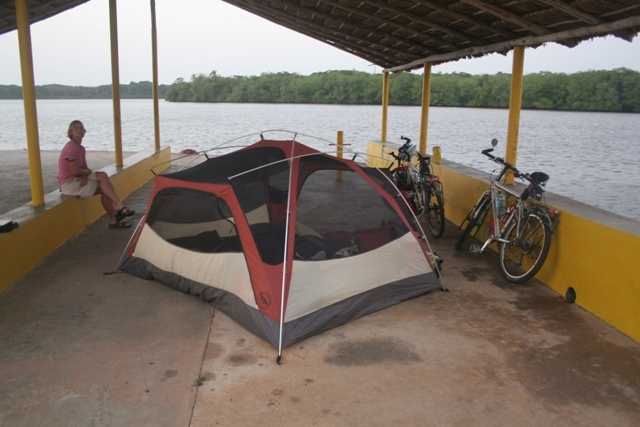 We felt quite safe biking through Los Llanos and Amazonas, but locals warned us that armed highway bandits are a possibility. Again, be vigilant and don't bike in urban areas after dark. You'll pass through loads of road blocks as you cycle through Venezuela. There's no need to be alarmed, no one will hassle you for bribes or even bother asking for your passport in most cases. Military and police were very friendly to us in Venezuela, offering us ice cold water and on one occasion even soft drinks. We even camped at one police road block and on another occasion the police arranged for us to camp inside the school grounds. Any advice or questions about Biking in Venezuela?